Okay, my family was WAAAAAAY to excited to try this little product out. It's this tiny bottle with 100 drops of "personal odor eliminator" so it should last about a week in my house! You're supposed to put a drop in the toilet BEFORE you do your stinky bizness, but the kids keep forgetting. Plus I put it in MY bathroom because I knew if it was in the kids' bathroom it would all be squeezed into the toilet at once or into the sink or God knows where else. *I don't personally need this product since everyone knows my stuff don't stink. 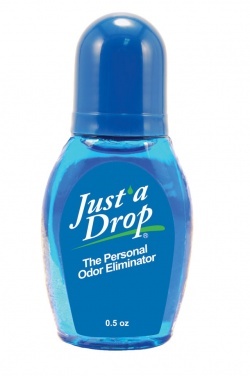 "Just a Drop is revolutionary because it eliminates personal bathroom odors BEFORE they enter the air. Place 1-2 drops into the toilet BEFORE you go, and odors are trapped below the water surface until they are flushed away. All you leave is an odor free bathroom." It comes in 7 scents and big sizes for families like mine. It was featured on Dr. Oz and The Doctors! So if you know you are going to make a BIG STINKIE, you put 2 drops in, got it? So this was tried out in my house and it does kinda rock. Better than an aerosol spray or a candle that will burn the house down or lighting matches over and over or running the sucker fan for an hour. Is it wrong that I am blogging this with a goofy, juvenile smile on my face? Okay, so this is a terrific product! And the company is offering you a 20% discount on your first purchase with the coupon code Blogger. Follow them here on Facebook and here on Twitter! I give this 5 Dove Chocolate Hearts out of 5, because I am off the Weight Watchers wagon temporarily.